Puddle jumpers and snow angel-makers of the world rejoice. These waterproof booties were made with you in mind, featuring a Barefoot wool-blend lining and EcoSystem technology that helps keep your feet warm and dry no matter where you're splashing around. 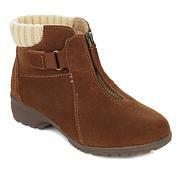 When pulling on, please ensure the elastic splash guard at the opening of the bootie is upright and not tucked in. Use pull tab to slide foot in. Really nice and fashionable not to mention practical. 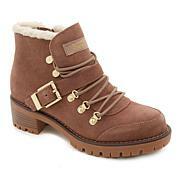 I ordered these for trip to Utah in fall. I have a white jacket and wanted white waterproof boots for rugged terrain. They are comfy and cute ! Fully waterproof, attractive and extremely comfortable. Have worn them to work out in. Wish I had them in additional colors! Strongly suggest them. My 32 y/o daughter is not particularly enchanted with them which means I have them all to myself. PERFECT all-day comfort with the Copper Fit knee-hi compression socks! With a high instep, it took me a minute to figure out to slip my foot in holding onto the front+back tabs. I purchased TWO pair-gray for myself + champagne for my FASHIONISTA 16 year-old. We both LOVE them! !I travel a LOT, these are perfect through TSA checkpoints. My feet have stayed dry & warm from Michigan to Missouri all winter long. My 16-year old walks to school, these are her go-to for cute AND toasty toes all day! First time buying the Sporto brand and I love this bootie. We were dumped on this week with snow and my feet were kept dry and warm while shoveling and walking at work. I wore them all day at work because I work in a warehouse and they were comfortable to wear all day.